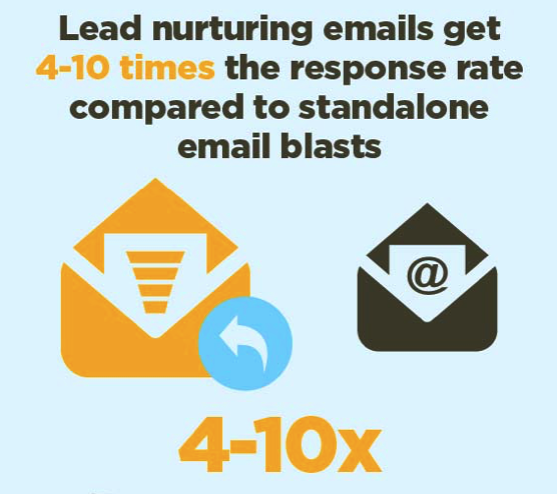 Email is 40x more effective than social media marketing at driving sales. And you thought email was dead. Well, at least that’s what some reports are suggesting. But these reports are greatly exaggerated and here’s why. The myth that email marketing has lost all power generally comes from the idea that digital communication has evolved with new technologies. Many organizations and individuals, especially among younger age groups, are using Facebook Messenger, Instagram, Twitter and other platforms to interact with brands. But this doesn’t mean email is dead. In fact, a whopping 59% of B2B marketers say that email marketing is their most effective channel for generating revenue. They’re also finding new ways to reach their target audiences. Which brings us to our next topic: What’s trending in the world of email? How can you innovate your strategy this year and capitalize on the new age of email communication to drive better results? Adding a personal touch to your messages is more than just using your prospect or customer’s name over and over again. You need to set the tone of your email starting from your personalized subject line to content execution. Divide your subscriber list into smaller segments based on specific criteria, such as demographic, interests, behavior (such as purchase history), geographic location, etc. Talk to them directly. 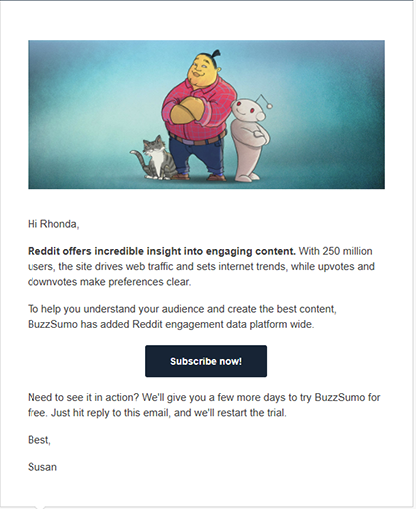 Here’s a great example from HubSpot. They start the conversation by saying the receiver’s name and catering to their interest. The message is concise and to the point, informing the receiver of a new certification course. Its ending “See you in class” is a clever nudge in the right direction. As your subscriber list grows, it’s hard to give the attention your prospects need to convert into customers. That’s where email automation comes in. 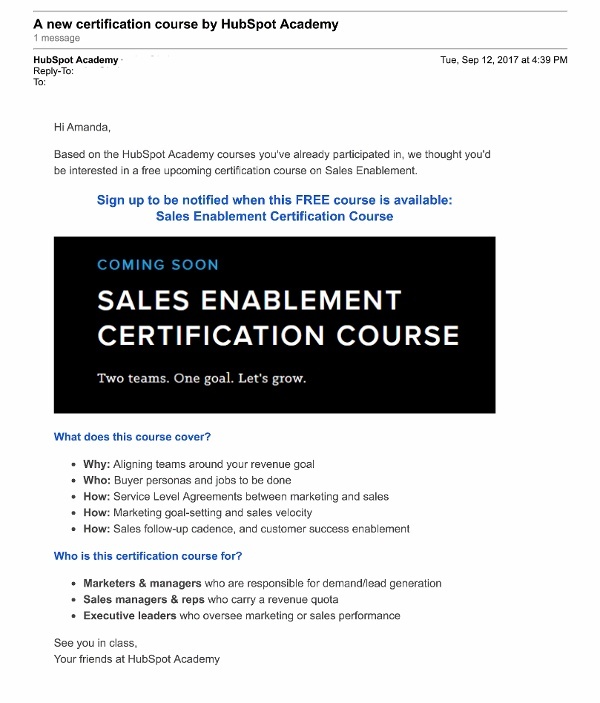 With great tools like HubSpot, you can easily create automated email workflows to send personalized, relevant and timely emails. Truth is, most of the leads you generate are not ready to buy on the spot. These prospects are searching for information before they decide to contact a salesperson or make a direct purchase. Therefore, aggressive email marketing won’t help. In fact, your email will most likely end up being moved to their junk folder. Nurturing focuses on building a relationship with them by sending helpful and relevant content. Make sure to find a balance between sending informative content and moving them to the purchasing stage. An automation tool is great for this type of selling. The goal of your email campaign is to get a response. In addition to having a strong subject line and solid offer, you also need to have a clear call to action (CTA) button for them to click. Use a contrasting color for your CTA button that fits your brand. For example, if the background of your email is white, make your CTA button green or orange. Make sure your button text is large and legible. Keep it above the fold (near the top of your email) so users don’t miss it. Your prospects and customers are using multiple devices each day. In this study, 55% of emails were opened on mobile devices. 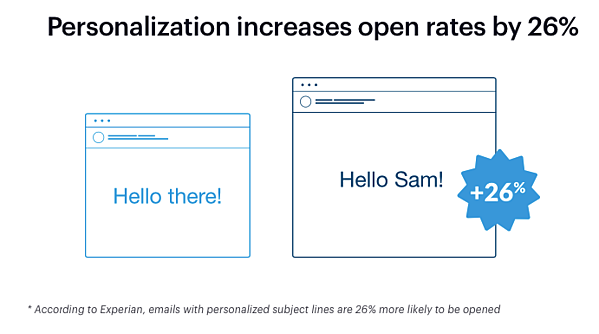 So if your emails aren’t optimized for mobile, you may lose a lot of opportunities because users couldn’t read them, or worse, decide to opt out from receiving future emails from you.